Hugh Sutherland late governor of LPH died at Swiney 15th May 1917 aged 74. Son William Sinclair Sutherland died at Latheron October 1905. Daughter Rachel Sutherland died at Aberdeen October 1910. Daughter Marjory Sutherland died at Glasgow March 1914. 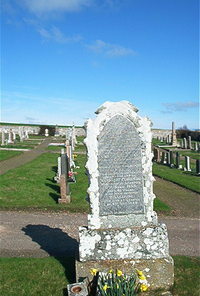 Wife Margaret Ferguson died at Lybster 11th April 1935 aged 91. Daughter Willianina Sutherland died at Lybster 8th February 1948. Seperate plaque 'In loving memory of W S Sutherland aged 19 years.